Splendour is a game where you are collecting gems in order to gain the favour of rich nobles, so yes this is a medieval trading game, sort of. It’s all about collecting gems, trading your gems and collecting favour cards. Splendour is the only game on this list that has come to my attention before the nominees were announced. It’s had several outings at my local gaming group and appears to be popular for the “there’s 45 minutes left” selection of games. The game of Concept is made of a straightforward one, concept that is. 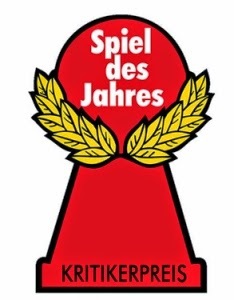 Players, usually in teams, pick a word and then have to create a clue from the cards available. Concept is an interesting variation on the themes of Pictionary and Scattergories. It’s not the kind of game I’d usually play but I have several friends that would love this game and I can see Concept selling well in the mass market. Camel Up is a game about racing camels; so I’m still not convinced that the game is actually supposed to be called Camel Cup. At its heart Camel Up is a simple betting game; bet on your chosen camel and watch it gallop around the pyramid as you attempt to help or hinder the various contestants. The trick here is the wooden camel pieces stack and any camel that moves also moves those currently on top of it. So that’s why it’s called Camel Up. Again this game isn’t my normal cup of tea (that’ll be a PG tips, milk and no sugar while you’ve got the kettle on) but of all the nominees this is the only game that I actually want to try, just because it looks so damn silly and betting games are always fun, especially when things goes horribly wrong. I’ll admit that I’ve loved several previous winners but they are the exception to my normal game collection. Most of my gaming favourites fall into the zombies, werewolves, Space Marines and Cthulhu end of the gaming spectrum and for a game that falls outside of that and still be a game I love it usually means it’s a truly great game, or my wife likes it. However I must say none of these games are drawing my interest. 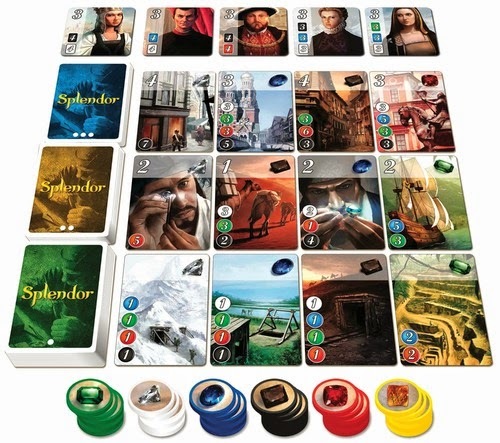 Splendour looks like it might be one of those games that only appeals with the playing and seeing some flat images don’t do it justice, Concept looks like a variation on a familiar theme and Camel Up looks like silly fun but does it have legs?